Most of us have experienced a 360 assessment where you learn how you are perceived by your boss, peers and direct reports. For some, the gap between how you thought you were perceived and how you actually are perceived can be vast. Closing the gap can seem futile – so much so that efforts to do so are eventually abandoned until it’s time for the next 360 assessment. And then, of course, there’s the information that could truly be helpful, but is withheld because participants don’t trust the process. Even with the help of a professional coach, certified in the 360 tool, receiving the results can be brutal. So, I was so delighted to find a 360 tool that is comprehensive and humane. It’s the Leadership Circle Profile. 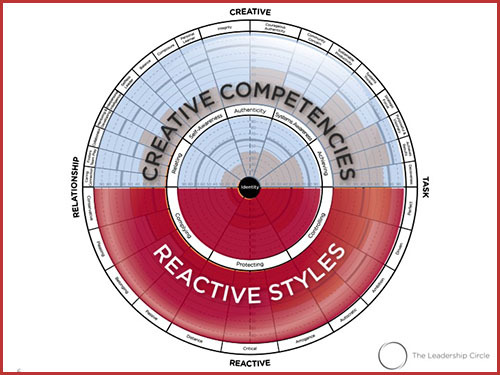 It not only measures 18 important leadership competencies, but it also measures 11 reactive tendencies. These reactive tendencies are behaviors that we have developed over the years that initially probably were a gift, but are now holding us back. For example, one reactive tendency is “Perfect.” While making sure our work is perfect may seem like a good thing, carried to an extreme it can make us controlling, intolerant of others, and unwilling to delegate. I have a colleague who received feedback using a traditional 360 profile that she played favorites among her direct reports. This feedback was so antithetical to who she was as a person that she was simultaneously crushed and incredulous. Luckily she had an excellent coach who pursued the topic with her direct reports and she found out she was being perceived as distant and aloof when she became very busy. This was something she could see in herself AND do something about. With the Leadership Circle Profile, this tendency would have clearly shown up as a reactive tendency with suggestions for follow-up. When I deliver the results of a Leadership Circle Profile to a client, they feel empowered to make changes that will improve their leadership rather than depressed that they’re not being perceived in the way they intend. The Leadership Circle Profile presents the results in a one-page summary backed up by a complete report of details. It provides actionable suggestions for leadership development along with a follow-up plan for ongoing learning. If you or your organization would like more information on this valuable aspect of coaching, click here to contact me.